Converse is located in eastern Bexar County. The Charles W. Anderson Loop highway around San Antonio passes along the eastern edge of Converse, separating it from Randolph Air Force Base. 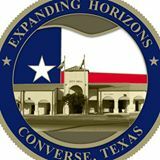 Converse is bordered by the cities of Live Oak and Universal City to the north, by the city of Schertz to the southeast, and by the city of San Antonio and unincorporated parts of Bexar County to the south and west. The town of Converse was founded in 1877 as a result of railroad construction. Our neighboring communities of Marion, Cibolo, Schertz, and Kirby were also founded during this era. The town of Converse is named for Major James Converse who was a learned railroad engineer working in Louisiana. The federal government summoned him to build a railroad line from Houston to San Antonio in the early 1860’s. Converse is a home of Judson ISD, St. Monica’s Catholic School, and La Petite Academy. In Converse, the population was spread out with 31.0% under the age of 18, 8.0% from 18 to 24, 33.9% from 25 to 44, 20.8% from 45 to 64, and 6.4% who were 65 years of age or older. The median age was 32 years. Estimated median house or condo value in 2011: $118,970 (it was $76,200 in 2000).